Welcome to the Chelsea Garden blog hop if you arrived here from Wendy Hopper's Blog, you are in the right place, if you arrived here by chance I am glad you stopped by and I hope my projects gives you some inspiration. To continue the hop click on the link at the end of this post. These beautiful papers and compliments are stunning, just wonderful for garden, girly or even masculine projects. 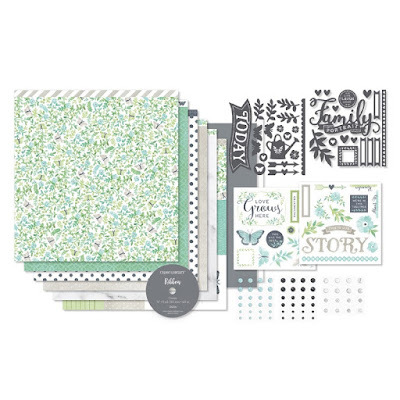 The Chelsea Gardens Cardmaking stamp and die cut set are also gorgeous and will compliment any project. I love how each pack of CTMH papers allows so many options, at first glance the Chelsea papers immediately make you think of pretty projects and that is what I have created with this layout. The delicate butterflies and flowers are exquisite and worked beautifully with these photos. I have used Jupiter, Sweet Leaf and Glacier Inks. I curled the edges of the flowers with a bone folder and added a few gems and when you adhered them with the 3D Foam Tape it gives them a bit of dimension. Bending the butterflies in the middle before you add them to the page also does the same thing. I used pattern 13 in the Make It From The Heart Vol. 3 Ideas Book for this layout. I have only used the right side as a single page layout. For this layout I used pattern 16 from the same How To Book, one of the great things about using these sketches is for each layout you have 4 options just by rotating the sketch in each direction. Again I have only used the left page of this layout as I only had 2 photos of this event. This is usually a rare occurrence for me, I normally have heaps of photos and needing to cull them is usually a problem. I have rotated the sketch so I have the strip of pattern paper on the top instead of the bottom. To decorate the layout I have used some of the elements in the Compliments pack and I've used the great Alphabet dies for the Happy Birthday title. The new Gift Card Box Thin Cut die (Z4150) is a dream to use and you can decorate it any way you desire, I have used the beautiful bold flower paper to decorate the top of the box and complimentary papers for the sides. You can stamp the box with a background stamp before you cut it out for a different look, adding a ribbon would be lovely. 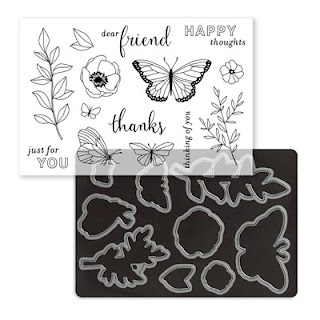 The lovely butterfly stamp and a sentiment is just what is needed to enhance the box. 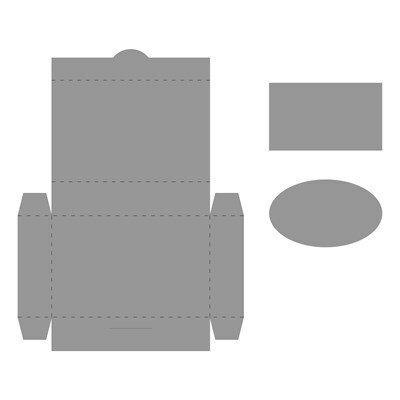 This new die allows you to quickly and easily cut a 3.5" x 2.75" x .75" folded box. There is the option to add a window or a tag to the box. As the name implies the box fits a gift card perfectly or maybe some tea lights or a few chocolates. To continue the hop click here to go to Megan's blog I am sure she will have something wonderful to share. I really appreciate it when you take a moment and leave a comment before moving on to the next blog. It is great to see the page ideas from the idea books done in different paper/colour combinations. Love your flowers on the first layout. And that little gift box is so cute! Beautiful projects Doris. I love how effective the polkadot lettering is with the stitch lines! Beautiful pages Doris, but I especially love seeing what you've used the gift box for - I hadn't gotten past chocolates!! Thanks for the inspiration. I love both your pages Doris. I think your spotting title is really striking. I really love that cluster of flowers on the first page. Really effective. Plus the splotches of light blue really add to the page (without detracting or over-dominating). Wow - that cluster of flowers looks wonderful & love the ideas of what to put into the gift boxes.